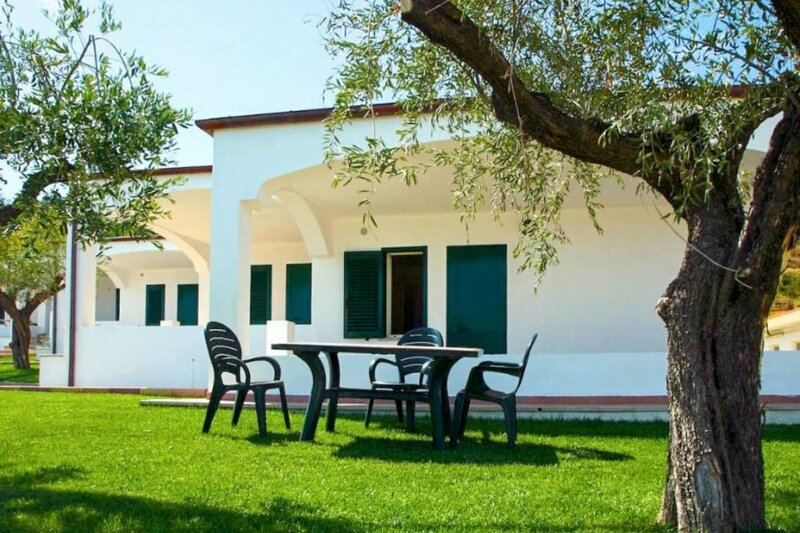 This 2 bedroom apartment with swimming pool is located in Torino di Sangro and sleeps 5 people. It has WiFi and air conditioning. The apartment is within walking distance of a beach. Terraced house, 4 - 5 people, 3 room/s, 2 bedroom/s, 1 bathroom/s, approximately 36 m², 1 floor/s, apartment on ground floor, separate access to the property. Feature: Property in a residence (max 1 floor(s), 8 building(s) in total, 30 units in total). Furnishing: holiday standard, friendly, tiled floor. Equipment: satellite TV; internet access Wi-Fi (included); combined heating/air conditioning. € 10 per person and stay (depending on occupancy). Heating/air-conditioning if required, € 10/​day. Holiday resort tax. Linen/towels Bed linen available. Towels must be brought along. Change of bed linen, € 7 per person. Towels available on loan, € 5 per person/​change (on order). Deposit € 100 (in cash, Visacard, Mastercard). Extra bed € 15 per person/​day (on order). Cot/​High chair free of charge (on order). Pet 2 animals allowed, € 50 per pet and stay (small pet only; please advise prior to arrival). Situation: hillside location, sea view. Access/parking: car park; parking in the holiday complex (payment). Estate (shared use with holiday guests): approximately 7 ha, partially self-contained (fence). Pool (shared use): 20.0 x 7.0 m, 1.60 m deep, open throughout the entire season, open from 9:00-AM-1:00-PM h and 4:00-PM-7:00-PM h, children's pool. Pool area: tiled, deck chairs (included / depending on availability), sun loungers (included / depending on availability), sunshades (included / depending on availability), external shower. Please note: obligation to wear bathing caps. Wellness: shared use (payment): whirlpool (available during the whole season). Sports facilities/ leisure time: shared use (free of charge): football pitch, children's playing equipment (available during the whole season). Entertainment: included: evening events (approximately middle of June until middle of September). Day care: included: animation for children, children's club (approximately middle of June until middle of September). Infrastructure: breakfast service (available during the whole season); washing machine (coin-operated). Bar/cafe, restaurant (available during the whole season); Shuttle service (approximately June to September, limited service in the off-season); half board, full board: payment and request on-site. Plot description: terrace 20 m² (roofed), furnishing provided. The agent describes this apartment as an ideal holiday rental for the summer holidays. It is also good value for money. The apartment has a swimming pool and is located in Torino di Sangro. The nearest airport is 62km away. It is set in a very convenient location, just 0 metres away from a beach and only 2.5km away from the city center. The apartment has free wireless internet. The apartment is adequately equipped: it has air conditioning and a washing machine. The apartment is suitable for relaxing winter holidays.